Ehiz Blog: Happy 54th Independence Day Nigeria! 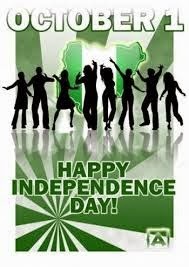 Happy 54th Independence Day Nigeria! I dropped off the lil one in school today, all decked in native attire. His school is celebrating October 1st; Nigeria's Independence day. The day where we told the British to sod off, and they did. Quite quickly, if I may say so. Of course, we have our founding fathers to thank for fighting for our independence. But there is someone (or something) we always forget to thank - the mosquito!. Lets face it: if not for the mosquito, the British may have stayed for longer. But thanks to the famed anopheles, they were all too happy to leave. I jokingly tell my friends that our national coat of arms should feature the mosquito and not the eagle/horses... (hehehe). As I drove through Isaac John street, I saw that all the kids were dressed up as well. They all looked so happy and cute. It took me back to my childhood days, the good ole' days where Independence day celebrations were a BIG deal, and was second to Christmas. Literally. We always went to the stadium (Ogbe Stadium) for a fun filled ceremony. There were speeches, cultural displays and of course the much anticipated March Past. We would rehearse for months on end, until we got every step right. And then we would go to sleep the night before, quivering with excitement. When the day dawned, we would greet everyone and anyone - Happy Independence Day! We would get dressed in a hurry. No one wanted to be late to the stadium. It was the same outfit every year - firmly starched dark green uniform with a matching cap, the bright yellow neck-kerchief, glistening white socks, pulled up to our knees, and shiny black shoes. This was my uniform (I marched for the Adventist Youth Society, the youth arm of my church). We would line up in the stadium for hours, patiently waiting for the march past. As usual, the governor would arrive late. But it did not matter. We would practice our moves, chat with friends who were participating in other schools/societies; and we would dream of the ice cream we would have after the ceremony. And we would wait for our commander to scream: "By The Center, Quick Time!!!! And off we went, marching proudly across the stadium, navigating the sharp bends with swift turns. And as we marched past the governor standing on the podium, our commander would scream - "Eyes RIGHT!" And together, at the count of two, we would swing our necks firmly to the right, and simultaneously, our right hands would swing towards our heads for a crisp salute! And we would march past the podium, swinging our left arm only (Left, Right). It then became a matter of skill and dexterity. To keep marching on a straight line, while your eyes were turned away to the right. March past over, we would return to our designated stand, and giggle with endless excitement, and pride. Because we knew our parents would have seen us LIVE on television, marching in honor of Nigeria. And then it was time to eat all the goodies pre-arranged by parents and the church, and sometimes the government. But before we ate, we would do what all military people do: We would remove our caps in respect to the uniform, and tuck it carefully in the 'cap holder' on our shoulders. Then and only then, would we enjoy the ice cream, cakes, groundnuts, biscuits and sweets. We would say goodbye with sad faces to our friends with a 'See you Next Year' promise. And we would go home, happy and tired. Waiting eagerly for the next celebration. Sadly, there are no more stadium events. Because of security risks. Because of terrorists and the stadium being an obvious potential target. And it makes me sad, because the new generation would not have the opportunity to witness the strength and unity of Nigeria. On that stadium, it did not matter what tribe, religion, political party you were. You were Nigerian. And you were Proud. And that was all that mattered. But the good news is that the celebration lives on. Even if it is the children having little parties with traditional meals in school, the celebration lives on. Even if it is only a short Presidential message to the country alone, the celebration lives on. And we are all reminded that some time ago, people were bold enough to stand up to a world power and demand independence and freedom. Agreed, there is a lot that is left to be desired. And our recent leaders have huge opportunities (tell me about it). And everyone should play their part to building the country as opposed to tearing it down. After all, it all starts with the 'Man in the Mirror'. But, not a day passes that I am not proud to be Nigerian and to be Independent. It beats being slaves to colonial masters. And as an aside, with our skin color, we all look great in Green/White/Green. Happy Independence Day Nigeria! Here is to another 100+ years! Interestingly, Buchi, I loved marching. I marched so much at NYSC camp that I passed out on the parade ground and was restrained from participating in extra drills. "The day where we told the British to sod off, and they did. Quite quickly, if I may say so." - this is my favorite part of this piece, but with one exception - I don't think they left quickly enough. They were quite reluctant to leave, and we thank Zik, Awo, Balewa for their tenacity and the mosquitoes for their bloodlust. I've sometimes had cause to despair at our reputation in certain international circles, but there's never been any doubt about it - "I'm proudly Naija!!!"